she pauses for a passing thought… – Christing C.
Zara vest, dress from random boutique in Hong Kong. 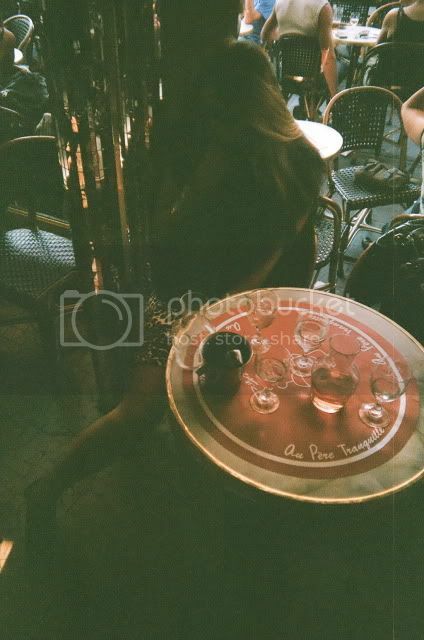 Here are a few of my disposable camera pics from Paris. I’m kinda enjoying the vintage effect. Life can be slightly guilt inducing at the best of times. This blog, rightfully named Fashion Hedonism, documents my love for all things fashion related and my indulgently hedonistic lifestyle. I must admit, I have an extreme penchant for doing only that which pleases me. I search for the moments that will satisfy my cravings in the present, not considering the consequences of the future. I yearn to reside permanently in my early 20’s, with an unlined innocent seeming face, the stamina to party for nights on end, the tolerance to live in a heap of mess, and a complete disrespect for strict schedules. There are times I do wonder when I will tire of waking at any hour I please, existing in absolute comfort, and possess enough single mindedness to ignore problems until the situation is dire. For now, it is barely a passing thought, but there are flashes of contemplation when I stop to truly swim in the luck and bliss I have been granted, as I know we can not remain forever young. I agree, I don’t want to leave my 20s ever, but they seem to be slipping past too quickly. Love love your outfit!! !great dress. i love your new look tv clip! love the vest! it’s the perfect outfit for summer-fall transition. Don’t feel guilty, we’re only young once!! I’ve been visiting your blog for some time now but have never left a comment. I just wanted to say how much I appreciate your writing. It is a relief not having to read through egregious typos, unnecessary lols and personal lingo I don’t quite comprehend. Your writing is pure and I enjoy it. I promise to leave an outfit comment soon. that is such a cute outfit, not many people could pull that off. such thoughtful thoughts in your posts. makes my grammar on my blog even worse then it already is. nice blog! wow! I echo every one of those sentiments! I too am constantly indulging in the sweet things in life, living for luxuries big and small. Nothing beats vintage pictures. My flatmates and I have started keeping a polaroid camera around to take pictures with every visitor that comes round and pin them on the walls! p.s. I’m a newcomer to your blog and loving it. Really connect with your style! Gorgeous outfit, love the dress and the vest! Love the vest with the animal print! Check out an Aspen girl’s blog & see her Chanel necklace at http://www.fashionsnag.com! this is hooot! i love Zara vest 🙂 i have to get it! wow. love the dress + vest! quite a combination! i havnt hit the 20 mark yet (still got 2.5 years) but i agree, i wouldnt wanna leave it either! that last picture really fills me with the craving to go to Paris. wait, that’s a lie, it increases the craving! and love the 1970s feel of your outfit here. everybody should own some leopard skin. Girl friend that’s just the way to go! Living the moment! As soon as you know you’re not missing anything… It’s fine! WOW! That first pic is stunning! You look amazing girl, have fun in Paris! Im in love with this outfit…I’m totally digging faux fur and you are totally rocking your outfit…..